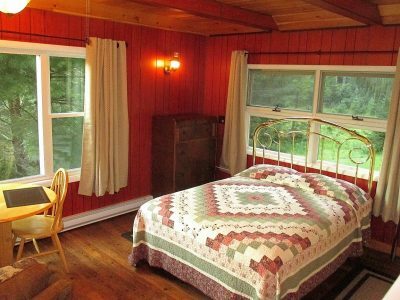 Adirondack Cabin Rentals: Lodging is available in studio units (ideal for a couple or solo traveler), private tupas (cozy 2, 3, and 4 bedroom housekeeping cottages) and our four bedroom farmhouse. 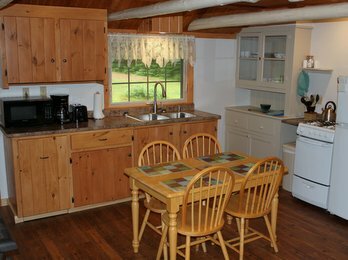 All our lodging options feature a fully equipped kitchen with refrigerator-freezer, stove-oven-broiler, microwave, electric coffee maker, toaster, all pots, pans, utensils and dishware. Linens are included. In the winter, lodging includes use of our outdoor facilities (private XC ski and snowshoe trail system, junior tubing hills, and ice skating pond) plus illuminated night skiing and use of our wood burning sauna. In warm weather, lodging includes use of canoes, kayaks, rowboats, paddle boats, private beach & swimming facilities, beach toys, lounge chairs, swing sets, lawn games, hiking and biking trail network, and wood-burning sauna. Our Studio Lodging provides an efficient space for a couple or a solo traveler. We currently have one studio unit, the Owl’s Nest, and expect to add an additional studio unit in the fall of 2019. The Owl’s Nest (360 sq. ft.) is a newly renovated, efficient space overlooking our pond. It offers a kitchen area, private bathroom, a queen bed and a cozy, propane fireplace. Winter: Rates cover up to two guests and range from $150 to $185 midweek; $230 to $265 weekend and holiday. The Owl’s Nest is for parties of one or two guests only. Spring, Summer, and Fall: Rates cover up to two guests and range from $119 to $149 midweek; $139 to $179 weekend and holiday. Maximum two guests. Visit our lodging booking page to see additional photos and descriptions of our lodging choices, check rates and available dates, and make reservations online. Our Tupas (Finnish for housekeeping cottage) are perfect for small to medium sized groups. We have a total of nine tupas, ranging in size from two bedrooms with one bath, to four bedrooms with 2 baths. These Adirondack cabins have a wood or propane stove as the primary heat source, with electric baseboard heat as a backup. Every tupa has a screen porch, great for storing your ski gear in the winter and catching an evening breeze in the summer. A brief description of each of our nine tupas follows. Visit our lodging booking page to see additional photos and descriptions of our lodging choices, check rates and available dates, and make reservations online. Pohjan – “House of the North”. 2 bedroom; 1 bath (560 sq. ft.) and accommodates up to four guests. Located near the connector trails to the east and west sides of the trail system and across from the junior tubing hills. Pohjan has a cozy, warm log interior with one full size bedroom and one twin bedroom. Spring, Summer, and Fall: Rates covering up to four guests range from $129 to $169 midweek; $149 to $199 weekend and holiday. Maximum four guests. Suksi – “Skis”. 2 bedroom; 1 bath (600 sq. ft.) and accommodates up to six guests. Located near the connector trails to the east and west sides of the trail system and across from the junior tubing hills. Each bedroom offers a double bed. There is a queen sleeper sofa in the main room. Spring, Summer, and Fall: Rates covering up to four guests range from $129 to $169 midweek; $149 to $199 weekend and holiday. Additional guest rates vary by season. Kota – “Lapland Teepee”. 2 bedroom; 1 bath (600 sq. ft.) and accommodates up to six guests. Located near the start of the Lake Trail and across from the main lodge building. Each bedroom offers a double bed. There is a queen sleeper sofa in the main room; woodstove has a glass front. Poro – “Reindeer”. 2 bedroom; 1 bath (650 sq. ft.) and accommodates up to six guests. Located near the start of the Lake Trail. There is one queen bedroom and one twin bedroom. The separate living room has a double sleeper sofa and can be closed off for privacy. Spring, Summer, and Fall: Rates covering up to four guests range from $139 to $179 midweek; $159 to $209 weekend and holiday. Additional guest rates vary by season. Pulkka – “Sleigh”. 2 bedroom; 1 bath (650 sq. ft.) and accommodates up to six guests. Located near the start of the Lake Trail. There is one queen bedroom and one twin bedroom. The separate living room has a double sleeper sofa and can be closed off for privacy. Ruska – “Fall Foliage”. 3 bedroom; 1 bath (650 sq. ft.) and accommodates up to six guests. Located near the start of the Lake Trail. There is one queen bedroom, one double bedroom, and the third bedroom has a set of bunk beds. Woodstove is glass front. Tunturi – “Lapland Mountain”. 3 bedroom; 1 bath (650 sq. ft.) and accommodates up to six guests. Not far from the start of the Lake Trail with the Vasa Trail running directly behind it. There is one queen bedroom, one double bedroom, and the third bedroom has a set of bunk beds. Woodstove is glass front. Lumi – “Snow”. 3 bedroom; 1 bath (800 sq. ft.) and accommodates up to eight guests. Not far from the start of the Lake Trail with the Vasa Trail running directly behind it. Two bedrooms each contain one full-size bed and the third bedroom has a set of bunk beds. There is a queen sleeper sofa in the living area. Woodstove is glass front. Spring, Summer, and Fall: Rates covering up to four guests range from $149 to $189 midweek; $169 to $219 weekend and holiday. Additional guest rates vary by season. Latu – “Ski Tracks”. 4 bedroom; 2 bath (1,150 sq. ft.) and accommodates up to ten guests. Located near the connector trails to the east and west side of the trail system. Two queen bedrooms, one twin bedroom, and the fourth bedroom has a set of bunkbeds. There is a full sleeper sofa in the living room. Maximum occupancy is ten guests. Latu has a large living room and eat in kitchen. Woodstove is glass front. Spring, Summer, and Fall: Rates covering up to six guests range from $179 to $239 midweek; $199 to $269 weekend and holiday. Additional guest rates vary by season. The Lapin Farmhouse is our most spacious and one of our most popular lodging options. This refurbished late 1800’s farmhouse is a wonderful year round choice for large groups and a must for family reunions and wedding parties. Having 2,000 sq. ft. with two stories and accommodating up to ten guests, the farmhouse overlooks our scenic pond with gurgling brook running alongside. Stunning original ash wood floors on the main level (carpet in all bedrooms) and many original antique furnishings give the farmhouse a feel of stepping back in time. In winter, the smaller junior tubing hill is right out the door with the ice skating pond at the base of the hill. Lapin is the perfect gathering place with a spacious living room, full dining room, and a breakfast nook. The first floor has one bedroom with a double bed and an adjacent bath with shower, and a full size sleeper sofa in the living room. The second level has a full bath with tub-shower, one queen bedroom and two twin bedrooms. Woodstove is glass front. Spring, Summer, and Fall: Rates covering up to six guests range from $209 to $309 midweek; $229 to $339 weekend and holiday. Additional guest rates vary by season.